Even though all year long is sweater weather here in San Francisco, something about fall that’s still new and exciting is the flavors. We love sipping Pumpkin Spice Lattes…even during our Indian summer. But at Avital Tours, we’re always focused on food. Here are six of our favorite San Francisco pumpkin-inspired foods we’ll be eating this fall to celebrate Halloween. Some are available all year round, but some of them are seasonal, so move fast. Pumpkin Ravioli – Lucca Ravioli Co.
Pumpkin pasta? Yes! 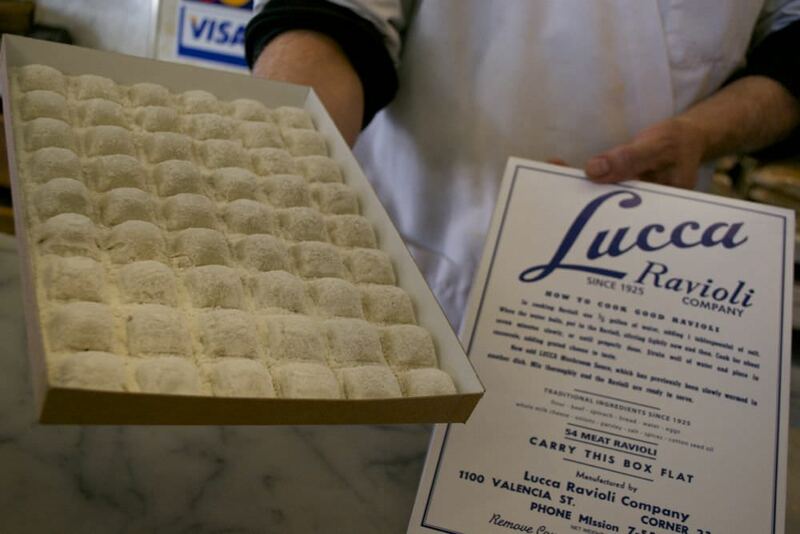 Lucca Ravioli Co. has been making handmade pasta since 1925. Classics like cheese and spinach might reign supreme, but the pumpkin variety has become so popular that they’ve made their way off the seasonal menu to year-round offerings. Lucca recommends putting the sweet pasta in a light butter or cream sauce with walnuts or sage. 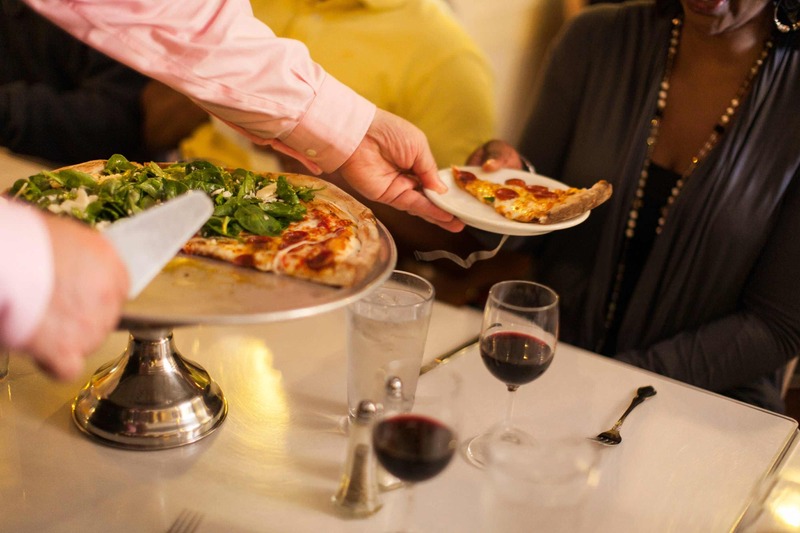 Located in the Mission District right on Valencia Street, it’s easy to pop into Lucca and grab ingredients for a fall feast. Luckily in the Bay, it’s still warm enough to eat ice cream outside in October. 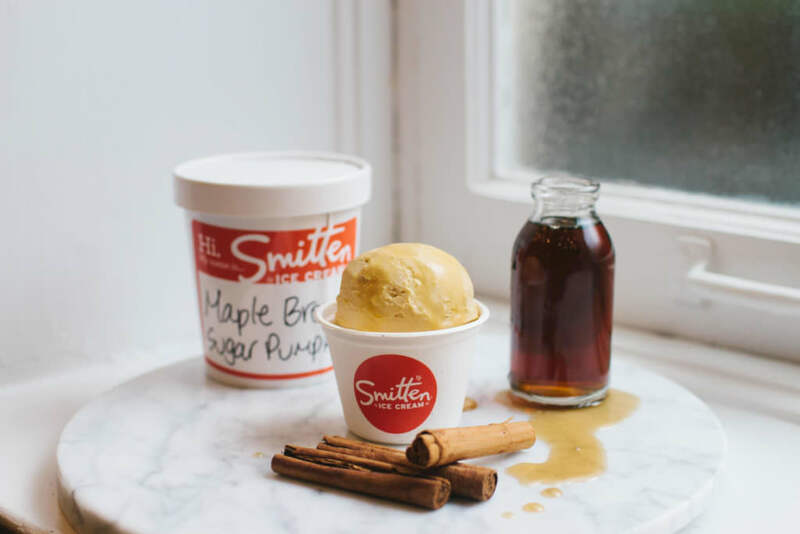 Smitten churns ice cream right in front of customers’ eyes using liquid nitrogen and fresh, seasonal ingredients. This month, one of those seasonal ingredients is roasted, puréed pumpkin. Smitten adds in dark brown cane sugar, maple syrup, nutmeg, allspice and clove to make a scoop that tastes the classic pie. In case that’s not authentic enough you can get a pie crust feel with oatmeal cookie crumbs and whipped cream. We’d order two scoops if we were you. 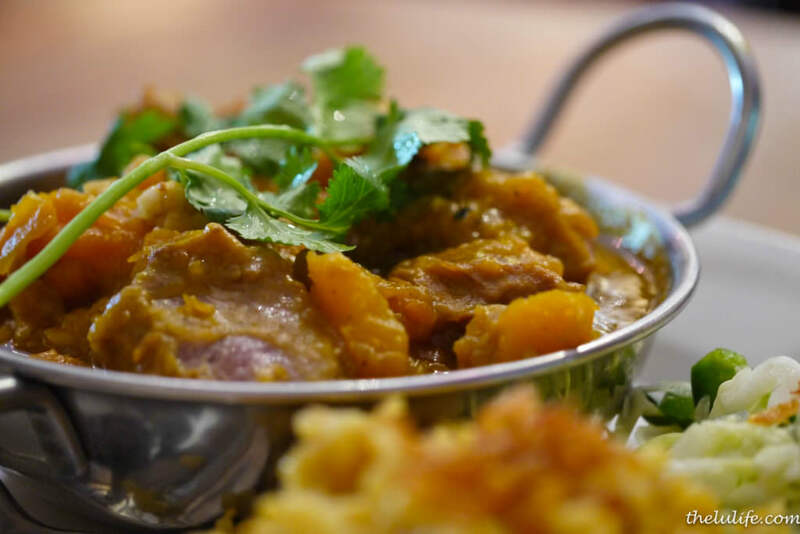 The popular Richmond District restaurant is well known for their tea leaf salad and samosas. But frequent visitors know that the Pumpkin Pork Stew, which is cooked with kabocha squash and ginger, holds its own on the menu. It’s hearty, warm, and filling, which is exactly what a fall dish should be. Luckily for locals, it’s available all year round at sister restaurant B.Star, too. Because as famous as Burma Superstar is for its food, its also famous for its long waiting times. This is one of our favorite seasonal treats we wish would last all year, but the women at Sixth Course are always changing up their offerings to reflect the season, their mood, and their favorite flavors. Sixth Course is one of those hidden Mission spots that’s off of Mission Street so it’s not east to come across on your own. We visit often for their handmade truffles, gelato pops, and pastries, and we never know what we’re going to find. 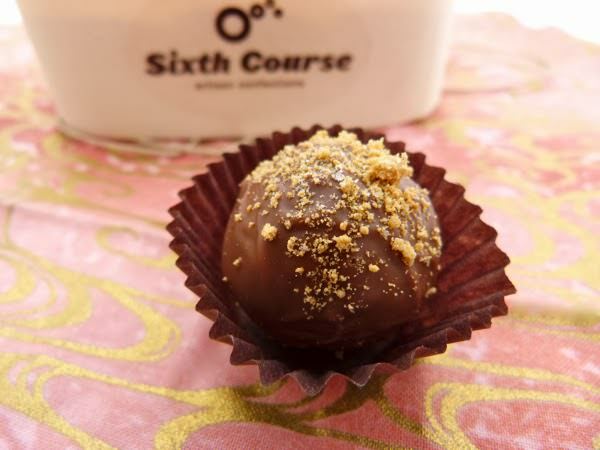 Luckily, we know that this month we’ll be able to find the Pumpkin Spice Truffle since it is the season. While you’re there, try some of their classics like Sage & Brown Butter Caramel and Bourban Maple Pecan, which also taste like fall. Pepitas, or pumpkin seeds, are a popular Mexican ingredient. We like snacking on them on their own, but they’re also great in salads, soups, and on Gracia’s Madres’s Quesadilla de Camote. Pumpkin might not be the star ingredient of Gracias Madre’s quesadilla, but the pumpkin seed salsa is the perfect topping. 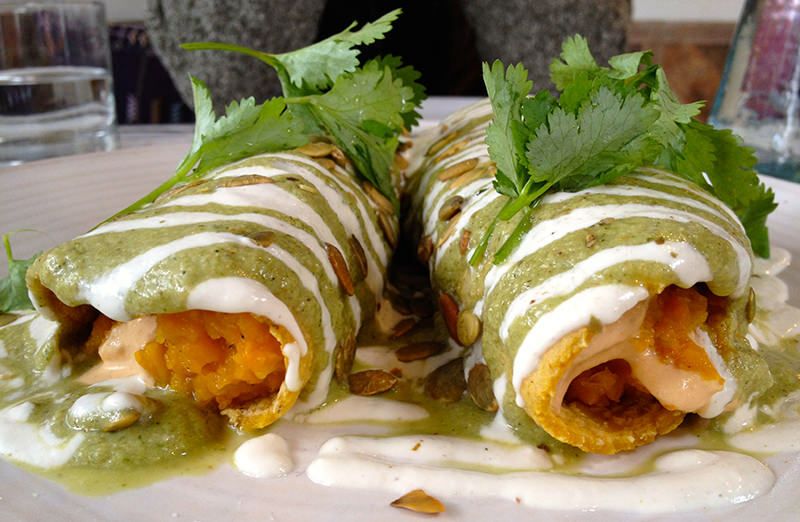 This quesadilla is one of our favorite vegan (and favorite Mexican) San Francisco pumpkin dishes. The quesadilla is hearty and a little bit spicy, and the pumpkin seeds add a little bit of crunch and flavor on top. We couldn’t skip a classic. 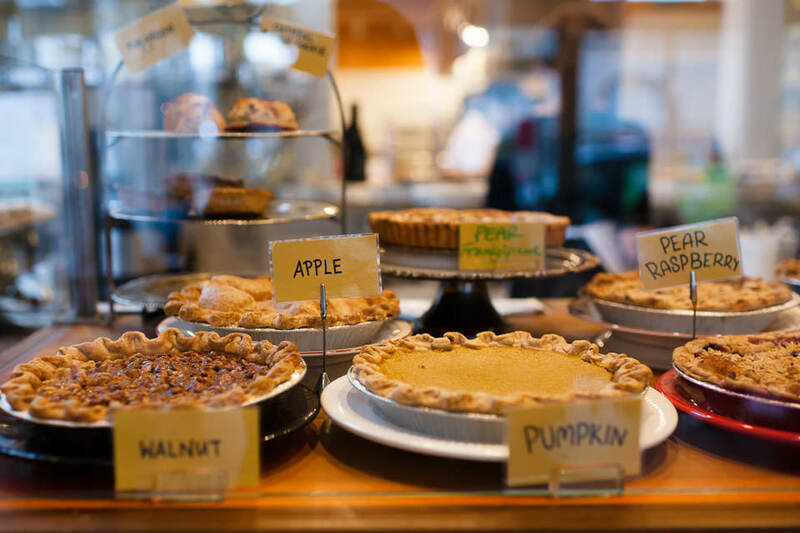 Mission Pie serves a variety of seasonal pies all year long, and we wait for Pumpkin season so our favorite is back on the menu. Is there anything special about this pie? Not really-but pumpkin pie is supposed to be a simple and consistent classic. What does make Mission Pie special? Well, there aren’t many places where you can sit with a slice of local pie and a pint of local beer during both a wholesome “After School Special” time that doubles as adult “Happy Hour”. Want more of San Francisco pumpkin recipes? Here’s one of Dosa’s Pumpkin Chutney. Want to try some of these San Francisco pumpkin inspired foods and visit Gracias Madre or Sixth Course Artisan Confections? Come join us on a Mission District Food Tour.